I love taking the time to write to you all. My great wish is that you take the time to read and consider what I have to say. Eventually, you may come to recognize that good horsemanship is fundamentally what WE do with our horses; from the time we pick up the halter at the start of our time with them. Many of you do not have the luxury of endless hours next to your horse. So, what you do with the time you have is of the utmost importance to be effective and, to enjoy doing it. That is why we have articles, and books, and clinics attending to all of the details of owning and working with horses. Expectations are what gets most relationships in trouble. Some think husbands (boyfriends) should know what the wife (girlfriend) wants – do the dishes, buy that style hat, say “X” at a particular time. But,as we all know, it doesn’t work that way. Husbands and boyfriends are forever wondering what the right thing to do for Tuesday and what the right thing to do is for Saturday. We girls know that the rules change at random. When on the horse’s back, heading towards the trail or the show ring or the practice arena, we expect our horse to perform because he did it well yesterday. When the cues don’t produce the desired result, we kick or yank or yell and call the horse names we shouldn’t. Expecting the horse to understand what we are asking for will get us into disappointment, then frustration and despair. So, what is the alternative? The alternative is communication. Like the husband or boyfriend who asks, “How can I bless you today?” He REALLY needs a specific answer. If the wife or girlfriend’s response is, “You should know if you really cared,” then, defenses rise up, both parties feel hurt and a great relationship moment is lost. 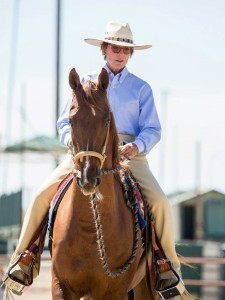 So with the horse – communication via asking with our leg cues, using our weight in the saddle as if it were a verb, then, getting enough tension in the reins so that the horse can put together all the cues as if words to a sentence, so that he has a clue of what we might be asking of him. If the desired response is not there, it is most probably because we have not taught the horse to respond to the leg cues in the first place. If the desired response is not happening, it is most probably because we have not taught the horse how to understand what different weight placements in our seat means. If the desired response is not forth coming, it is most likely that we have not sent receivable messages through the reins to the bit. Think of it this way – the leg cues are the dialing of the phone number. The weight in the seat is the ringing tone and the rein contact is the “hello”. Now a conversation can begin with a positive outcome. Remember, the horse has to put all these elements together and then try to get the right answer back to you. If he tries, but gives the wrong answer, don’t kick or yank or yell. Just ask again, with the same kindness and clarity you used the first time you asked. Then, reward the tries he gives back that are going in the right direction. The horse is not “wrong” when the desired response doesn’t arrive right away. Hemost certainly is still trying to figure out what you want. When he starts moving as we wish, he will try harder as we reward his “try.” Learning involves trying answers that are not correct. Understanding comes when the effort is happening to try to get what is desired. Reward the slightest try. Remember that and practice it. 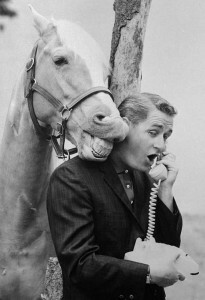 Your horse will connect and answer the phone.